Take advantage of recreational opportunities offered, including a sauna, a 24-hour fitness center, and bicycles to rent. Additional amenities at this hotel include an arcade/game room, shopping on site, and a television in a common area. Just three minutes’ walk from the main terminal of Helsinki-Vantaa Airport under a covered walkway, the Hilton Helsinki Airport hotel is the ideal retreat after a long journey or before an early flight. This contemporary hotel combines excellent service and a stylish interior with comfortable amenities.Stay up to date during your stay in the complimentary business center or get some work done from the comfort of your guest room with wireless internet access. Your modern guest room at this Helsinki Airport hotel features stylish wooden floors and furniture. Watch a movie on the LCD TV and refresh in the stylish bathroom. Upgrade to an Executive Room or Suite and benefit from special touches ranging from separate seating, private saunas and access to the Executive Lounge where you can enjoy complimentary breakfast and refreshments.Rejuvenate after a long journey with a workout in the fully equipped fitness room, or take advantage of the traditional Finnish sauna. Catch up with friends by the open fire as you sip on a classic vodka cocktail in Bar Gui. Restaurant Gui serves a selection of delicious Finnish specialties in elegant surroundings. Organize a Helsinki Airport meeting in one of this hotel’s 12 meeting rooms or an event in the impressive ballroom. Featured amenities include a business center, express check-out, and dry cleaning/laundry services. Event facilities at this hotel consist of a conference center and meeting rooms. Self parking (subject to charges) is available onsite. Featured amenities include a 24-hour business center, complimentary newspapers in the lobby, and a 24-hour front desk. Planning an event in Vantaa? 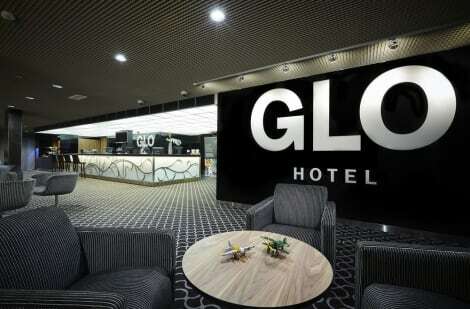 This hotel has 172 square feet (16 square meters) of space consisting of conference space and a meeting room. 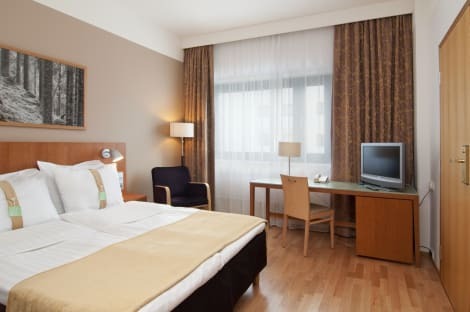 Aviapolis business district hotel with a free shuttle to Helsinki airport Holiday Inn® Helsinki - Vantaa Airport hotel offers comfy rooms and a free, 10-minute shuttle service to and from Helsinki - Vantaa Airport (HEL). 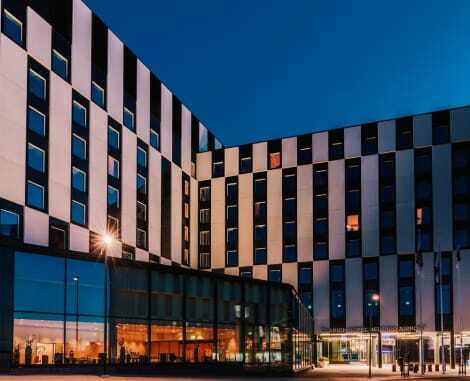 The hotel's location within the Aviapolis business district puts you a stone's throw from local businesses and 15 minutes' drive from trade fairs at Messukeskus convention centre. With space for up to 30, the hotel's eight naturally-lit meeting rooms are the ideal setting for your seminar or training event. The sprawling Jumbo shopping mall and huge Flamingo entertainment and dining complex are both an easy walk from the hotel. It's a 20-minute drive to Helsinki city centre, where you can see beautiful Art Nouveau buildings and interesting museums. In summer, borrow a bike from the hotel and explore the city at your own pace. 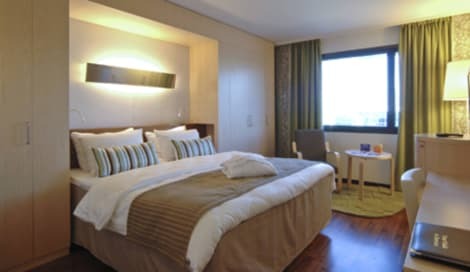 At this hotel you can enjoy: - A free airport shuttle - On-site parking for a daily fee - A Fitness Centre - Free Wi-Fi At this Helsinki hotel, kids stay and eat free and a choice of pillows ensures restful nights. Got an early flight to catch? Take advantage of the early breakfast service and the Park, Stay & Go package, leaving your car at the hotel until you return. Savour local dishes in the bright and airy Bistro Fiore, and sink into a sofa with a drink in the lounge. Enjoy a meal at Kulma or snacks in the hotel's coffee shop/café. Wrap up your day with a drink at the bar/lounge. Buffet breakfasts are available for a fee. Featured amenities include a business center, complimentary newspapers in the lobby, and dry cleaning/laundry services. Planning an event in Vantaa? This hotel has facilities measuring 18299 square feet (1700 square meters), including conference space. Self parking (subject to charges) is available onsite. With a stay at Break Sokos Hotel Flamingo in Vantaa (Aviapolis), you'll be a 2-minute drive from Flamingo Entertainment Centre and 6 minutes from Finnish Aviation Museum. This 4-star hotel is 3.8 mi (6.1 km) from Heureka Finnish Science Centre and 8.9 mi (14.4 km) from Linnanmaki Amusement Park. Located in Vantaa, this apartment is within a 15-minute drive of Flamingo Entertainment Centre and Jumbo Shopping Center. This apartment is 7.8 mi (12.5 km) from Hartwall Arena and 7.8 mi (12.6 km) from Helsinki Exhibition and Convention Centre. 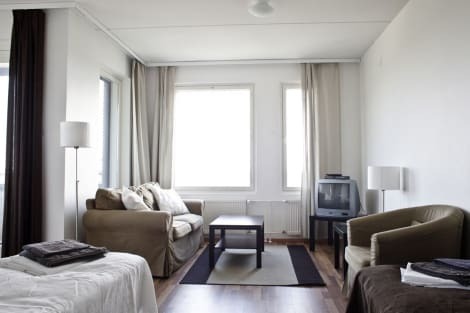 This smoke-free apartment was built in 2011.
lastminute.com has a fantastic range of hotels in Vantaa, with everything from cheap hotels to luxurious five star accommodation available. We like to live up to our last minute name so remember you can book any one of our excellent Vantaa hotels up until midnight and stay the same night.